Floating cities - fantasy or the future? Media captionFloating cities - fantasy or the future? 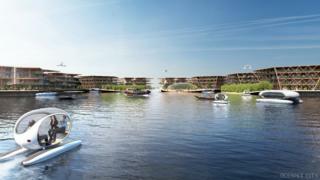 As climate change advances at an alarming rate and huge numbers of people cram into city slums, "floating cities is one of the possible solutions", UN-Habitat's executive director, Maimunah Mohd Sharif, says. 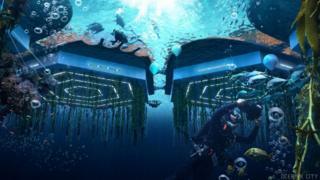 Oceanix City, or the world's first sustainable floating city, would essentially be groups of hexagonal platforms - anchored to the seabed - that could each house around 300 people, effectively creating a community for 10,000 residents. "There are thousands of such houses in the Netherlands and other communities around the world. It is now a question of scale and creating integrated systems and communities." "The caution I have is that sometimes people advance futuristic ideas of this sort as a way of saying climate change isn't so bad because if it happens we'll find a way around it," Michael Gerrard, director of the Sabin Center for Climate Change Law at Columbia University, told the Thomson Reuters Foundation in 2017. 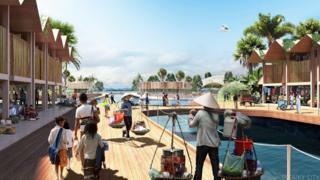 But Mr Collins Chen said Oceanix was working with a "solid team" of experts in waste management, water engineering, marine regeneration and energy efficiency. 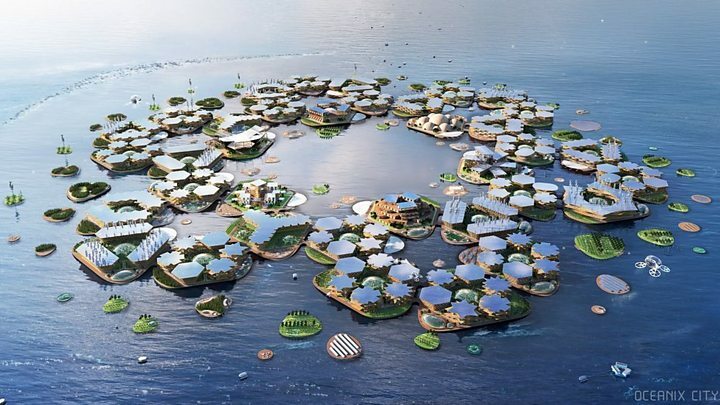 "Floating cities will be located specifically in sites where they will have sufficient water depth to not be impacted by tsunamis," he said, adding that the platforms could also withstand floods and hurricanes. "The main obstacles at this point are psychological and are not technological," Richard Wiese, president of The Explorers Club, told the BBC. "People psychologically get nervous at the term 'floating city'. I used this term to my wife, and her immediate response was not technological but rather visceral, she didn't like the idea of something that could drift away." "[Those] that fund infrastructure tend to be very conservative," said Steve Lewis, founder of Living PlanIT, a group that focuses on new approaches to urban planning and development. "They tend to invest in things they understand well and then you come along and say you're building a town floating on the ocean and they go 'really?'" "Proof is in the pudding and we'll see how it actually turns out," he said. "But I think we need to push the boundaries of what new life looks like in different environments. 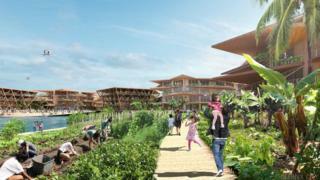 Even if it doesn't house 10,000 people, I think communities of a few thousand would benefit." Mr Wiese of The Explorers Club said that selling the idea to investors and the public need not be a "doomsday bunker scenario". "We need to demonstrate that it is an enjoyable, sustainable and economic advancement that will apply to all portions of the population and not just wealthy enclaves," he said. "If you look at Apollo 11, you have to remember that there were many small steps to create a moon launch," he added. 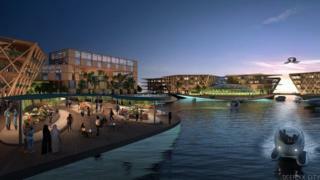 What if...you could design a city?